The jobless rate in the 17 countries that use the single currency was 10.4% in December, unchanged from November's figure which was revised up from 10.3%. Some 16.5 million people were out of work in the eurozone in December, up 751,000 on the year before. The highest unemployment rate remains in Spain (22.9%), while the lowest is in Austria (4.1%). Unemployment has been rising throughout 2011, as the debt crisis in the region has continued. In December 2010, the unemployment rate in the euro area was 10%. Guillaume Menuet, economist at Citigroup, said he expected the number of people out of work to increase throughout 2012. "If you think about the direction of employment expectations that you see across various business surveys, the outlook for employment doesn't look particularly enticing, simply because the uncertainty is very high. Much energy and argument has been spent on this agreement. It is questionable, however, whether it will have much influence on the immediate crisis. "In many cases you find firms continuing to delay investment projects. For those that are still making profits, hiring is being frozen, and for those which are under pressure to hit results or losing money, job losses are becoming the only solution that they have," he said. In the 27 EU countries, the unemployment rate was 9.9% in December, with 23.8 million people out of work. November's figure was also revised up from 9.8% to 9.9%. The biggest increases over the past year were seen in Greece, Cyprus and Spain. The largest falls took place in Estonia, Latvia and Lithuania. The issue of jobs and economic growth was a key area for discussion at this week's summit of EU leaders in Brussels. 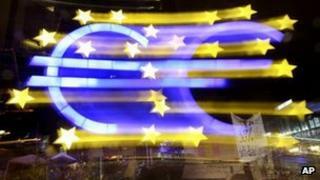 On Monday, figures showed that the Spanish economy shrank by 0.3% in the last quarter of 2011. It is now widely expected that Spain will enter recession in the first quarter of this year. Also on Monday, France cut its growth forecast for this year to 0.5% from 1% "to take into account the deterioration of the economic situation". At the Brussels summit, 25 of the 27 member states agreed to join a fiscal treaty, aimed at much closer co-ordination of budget policy across the EU to prevent excessive debts accumulating. The UK and the Czech Republic did not sign up to it. UK Prime Minister David Cameron said he had "legal concerns" about the use of EU institutions in enforcing the treaty, while the Czechs cited "constitutional reasons" for their refusal.